Celebrate the Winter Solstice with the North Flatbush BID!! Join us for Flatfoot Flatbush, a parade of dancers, fiddlers and pickers who travel through our district playing old-time tunes while flatfooting, a form of percussive dancing from Appalachia. Flatfoot Flatbush is Brooklyn’s first-ever flatfooting parade, celebrated as part of Make Music New York’s Winter Solstice Celebration. 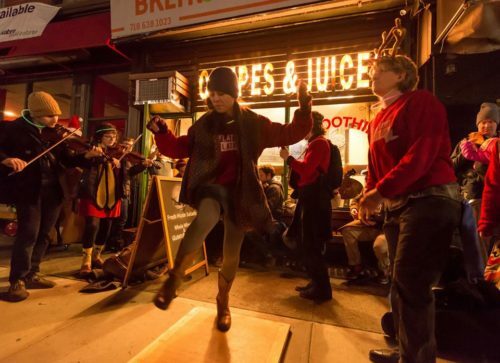 Now in its fifth year, the NFBID teams up with Porch Stomp, Make Music New York and the City Stompers to bring you another exciting year of music and dancing to ring in the holiday season. The evening begins with a free flatfooting workshop hosted by Megan Downes and The City Stompers, which will take place at 4:30 pm at 354 Flatbush Avenue at 8th Avenue. Participants will learn the fundamental steps of this rhythmic dance form and have a chance to practice with the Flatfoot Flatbush Band. Immediately following, the flatfooting parade will kick off at M&T Bank (184 Sterling Place) and travel down Flatbush Avenue, stopping along the way at local businesses to bring holiday cheer and engage onlookers in an occasional square dance. This year’s parade will also feature a special performance from the Brooklyn Conservatory of Music’s youth bluegrass jam class. The fun continues at an after-party featuring music and dance sets by the Flatfoot Flatbush Band. This program is produced by Nick Horner and Theo Boguszewski in association with the North Flatbush Business Improvement District and made possible with support from M&T Bank, Con Edison and New York Road Runners. Meet up at 4:30 pm at 354 Flatbush Avenue to warm up and learn the basics of flatfooting. The parade kicks off at 5:15 pm at M&T Bank (184 Sterling Place) and will make its way north along Flatbush Avenue. Participants can join at any point along the route – just follow the music! The after party at 354 Flatbush Avenue begins at 7:00 pm. Guitar, mandolin, fiddle, banjo players and other stringed instrumentalists are encouraged to join the Flatfoot Flatbush String Band! Go to www.porchstomp.com for a list of songs we are likely to play. Dancers and boosters are welcome to simply stroll on up! Flatfoot Flatbush is free and open to the public — anyone can participate. The event celebrates the warm, festive community cultivated by Brooklyn’s North Flatbush BID, along with the city’s vibrant folk music and dancing scene. Previous PostNFBID Announces Ribbon Cutting Ceremony for Reconstructed Triangle Parks!Next PostSanta Claus is Coming to Town!